If you are driving from Flagstaff to Sedona, or Vice Versa, make sure you take the Oak Creek Canyon route. Recognized as one of the Top 5 Most Scenic Drives in America, by Rand McNally, it is a winding road of breathtaking beauty. Initially you’ll snake quickly down switchbacks into the canyon that hug the edges of cliffs and then eventually opens into oaks with evergreen pines with a backgrop of red-faced cliffss. The drive is about 14 miles, and is a picture perfect landscape the whole route. One of the benefits of renting a car and not being on a time limit is the ability to stop and enjoy random sites along the way. The Chapel of the Holy Dove was definitely one of these moments. We passed the TINY chapel, and thinking it may have been a figment of my imagination, I had to turn around to make sure my eyes were seeing correctly. The entrance to the chapel (whcih looked like an outhouse) was no taller than I was, and is open year round for visitors or worshipers to enter. 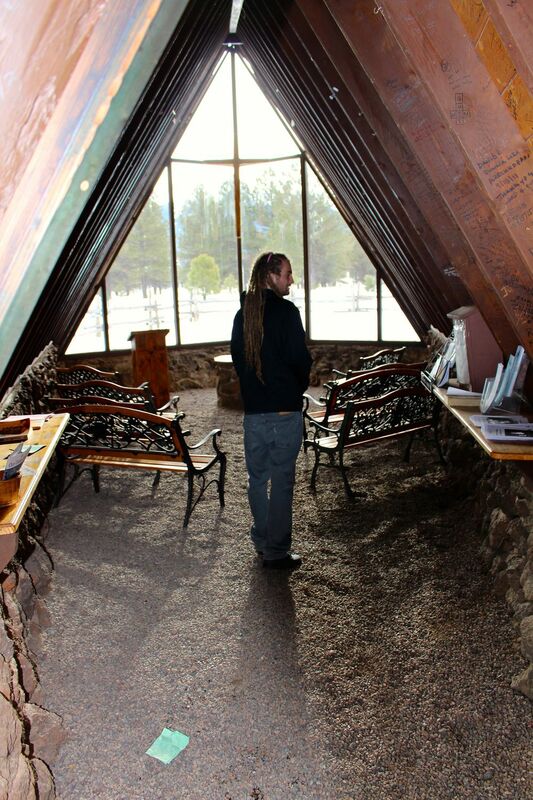 The entire back wall of the chapel is glass, providing a stunning view of the San Francisco Peaks. The chapel leaves free CDs of sermons in different languages that visiors can take. The visitors journal is not the only thing that interntional travels leave their mark on. The walls and benches of the chapel are filled with felt-tip pen signitures, prayers and town representations. The Chapel of the Holy Dove sits on a parcel of land originally part of a small ranch purchased by Watson M. Lacy, MD in 1960. He was the only physician at the Grand Canyon Hospital which he operated with his wife, Ruth. They came to this area for respite from the demands of the medical practice at the Canyon. The beauty of the Peaks affirmed the goodness and majesty of God. They wanted to give travelers the opportunity to share it. In the summer of 1961, with the help of his sons and some hired hands, the 41 year-0ld Lacy, with no experience as a builder, used explosives to create holes in the rock beneath the Chapel to secure and position the large Ponderosa Pine logs which comprised the original A-shaped structure framing the San Francisco Peaks. Local volcanic rock and petrified wood was used to build the supporting stone walls. This was a project for intermittent days off from his practice at the canyon. The Chapel was completed in 1962. Dr. Lacy died October 1991. The ranch property was sold but the parcel on which the chapel stands remains in the trust of his widow. On March 8, 1999, the Chapel was destroyed by a transient's campfire but the stone walls remained. Shortly thereafter, 18 year-old NAU student, Christen McCracken obtained permission from Mrs. Lacy to raise funds to rebuild the structure. Since the Chapel had become a popular landmark, the local public supported the project. Many materials were donated by Flagstaff merchants. Volunteers supervised by Flagstaff resident Ricky Roberts, completed the current Chapel, similar to the original, in April 2000. The Chapel is open to All. Four of Dr. Lacy's six children, the daughter of an Arizona governor and Christen McCracken were married here, besides many others. The chapel of the Holy Dove was named to acknowledge the Third Person of the Holy Trinity, described in Matthew 3:16 as descending "like a dove" above Jesus in commissioning His earthly ministry as God, Incarnate. The building was dedicated in memory of Dr. Lacy's brother, George, and nephew, Randy Lacy, who drowned in a boating accident in California in 1957. The original memorial plaque read: "In Memory of George and Randy Lacy whose great love in life and great courage in death made known the Glory of God." Lacy's profound grief resulting from the loss propelled great soul searching which led to a personal faith in Jesus Christ. Once an agnostic, he discovered "...the Way, the Truth and the Life" was to be found only in Jesus, who said of sacrificial love in John 15:13, "Greater love has no one than this, that one lay down his life for his friends." It is our prayer that all who visit the Chapel of the Holy Dove would experience God's love and power. Just a few miles before you enter Sedona, there's a Dairy Queen, at 4551 hwy 89 A, that has a setup of about 10 Native American vendors that sell fair priced and good quality souvenirs. You can find sterling silver jewelry, hopi and navajo pottery and turquoise pendants among other souvenirs. It won’t be fine jewelery like items sold at Garlands but the the jewellery is authentic and the prices reasonable.